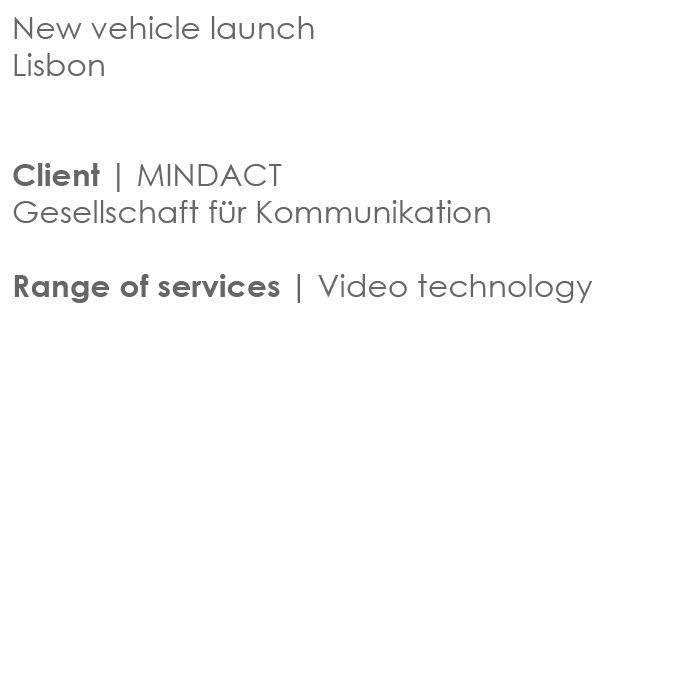 For a German automobile manufacturer’s retail launch in Portugal, Wilhelm & Maaß was in charge of the video technology. 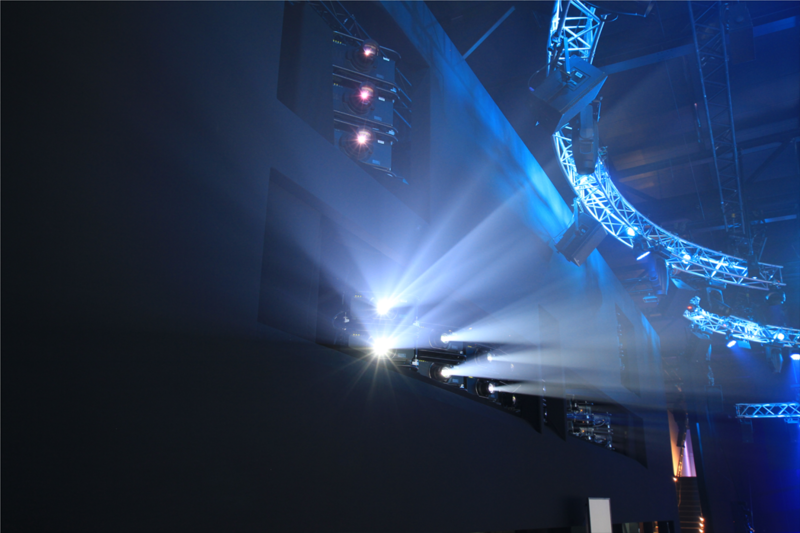 Our services included planning the video technology at five venues. 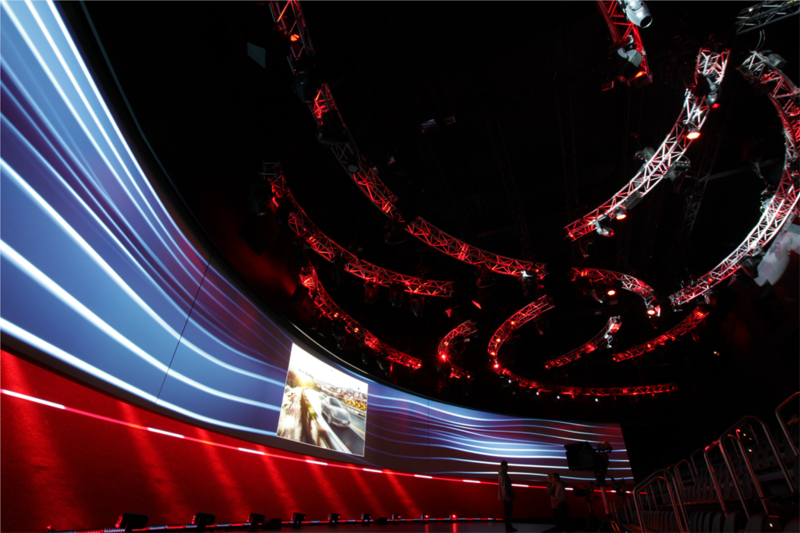 The central auditorium which housed the new vehicle exhibition was equipped with a 124-degree panorama projection illuminating three levels. 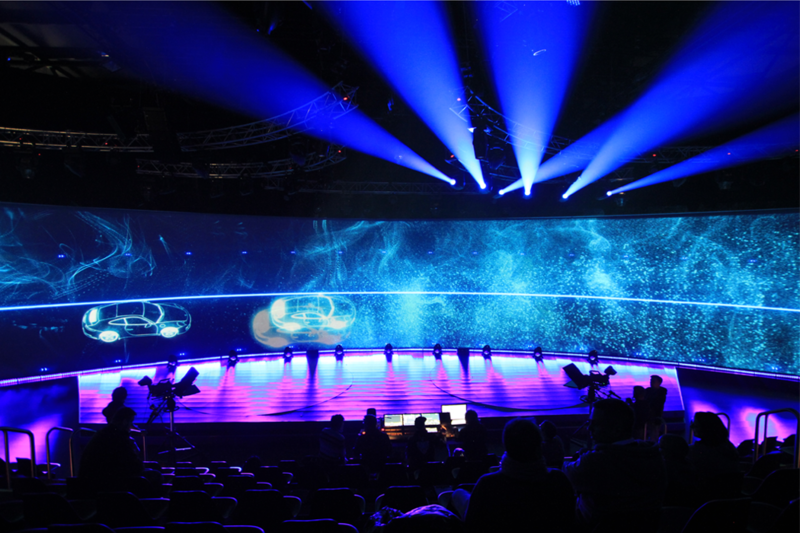 At the first level, a soft-edge projection consisting of seven 12,000 ANSI-lumen tandem projections was used for presentations and specially produced oversized animated films. During the show, the screen kinetically glided away, revealing the second level: a semi-transparent gossamer playfully illuminated by three 20,000 ANSI-lumen triple soft-edge projections. Our special use of the theme linked the projection and the goings-on behind the gossamer. 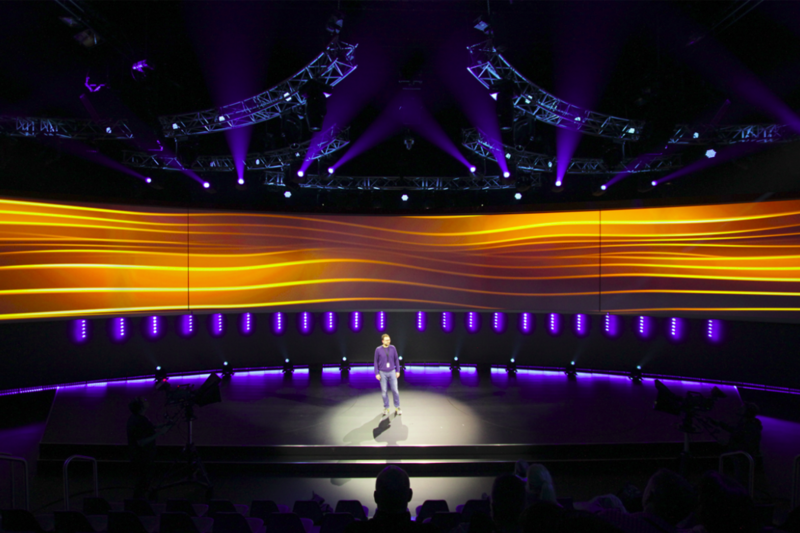 This projection surface was then removed using a Kabuki system to reveal the steep curve of the building’s interior, with a 64-m wide band of LED lights bordering the exhibition space. 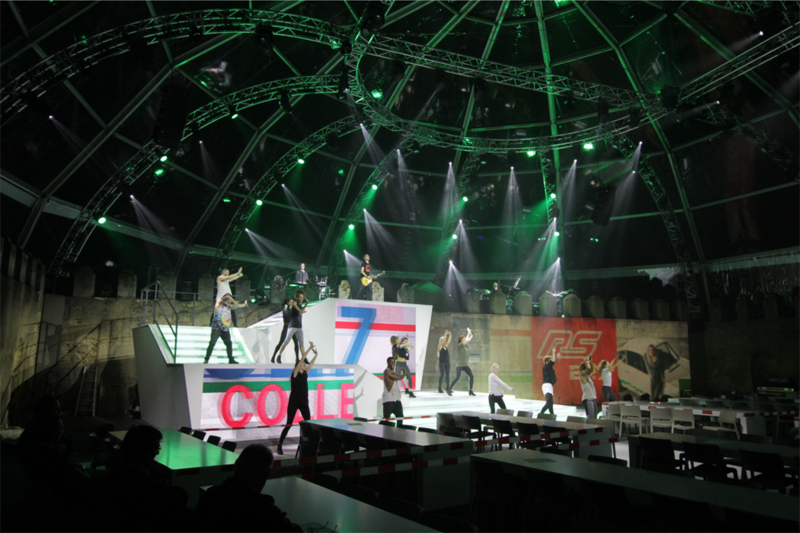 In addition to the three-level lighting spectacle, we created the illumination for four additional venues: the evening event with a combination of a wall of LED lights and façade projection, an unveiling at a second location, and workshops and exhibition spaces with ultra-high definition displays and holography. The planning included camera and directing work, LED technology, projections and data management, as well as feeding data into different media server systems (Coolux Pandoras Box and Dataton Watchout). 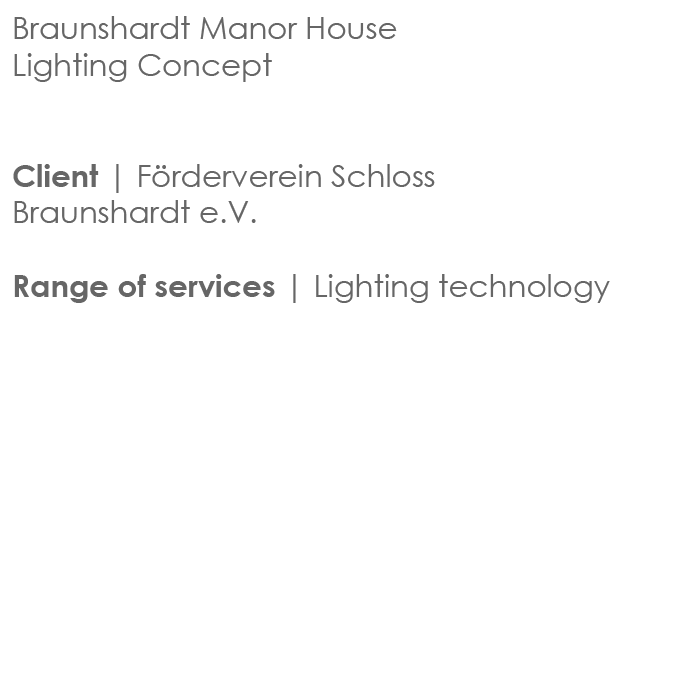 In 2012 the Friends of the Braunshardt Manor House, a non-profit organization, hired us to develop a lighting concept for the Braunshardt Manor House in Weiterstadt, Germany. 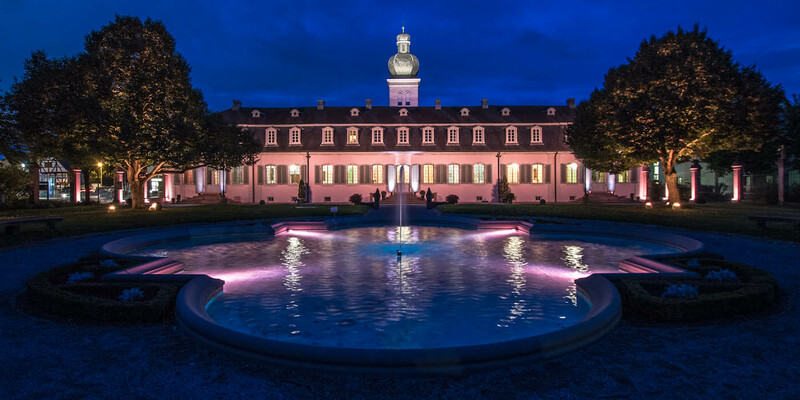 This rococo structure was erected in 1763 and is considered one of the loveliest manor houses of this period in Germany. 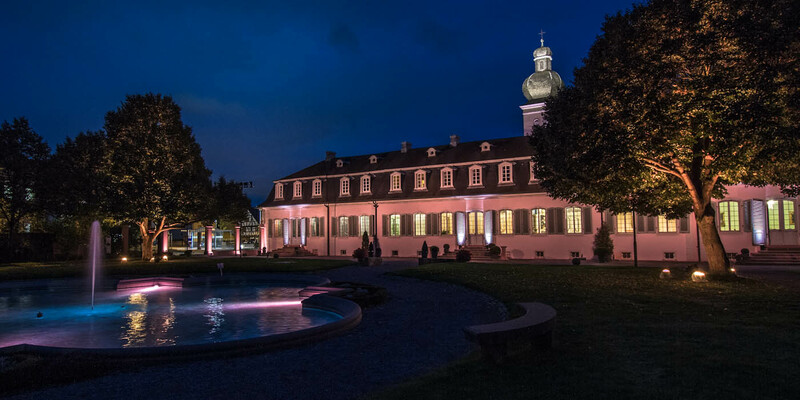 We worked closely with the Office of Historical Buildings and the City of Weiterstadt, the owner of the manor house. Our work included designing the technical infrastructure, calling for bids and supervising the subsequent construction work. The main focus was on coordinating the various parts of the project, which ranged from underground work, electrical wiring and lighting technology. A special challenge was to do this without allowing costs to balloon, while at the same time meeting the Office of Historical Buildings’ requirements. 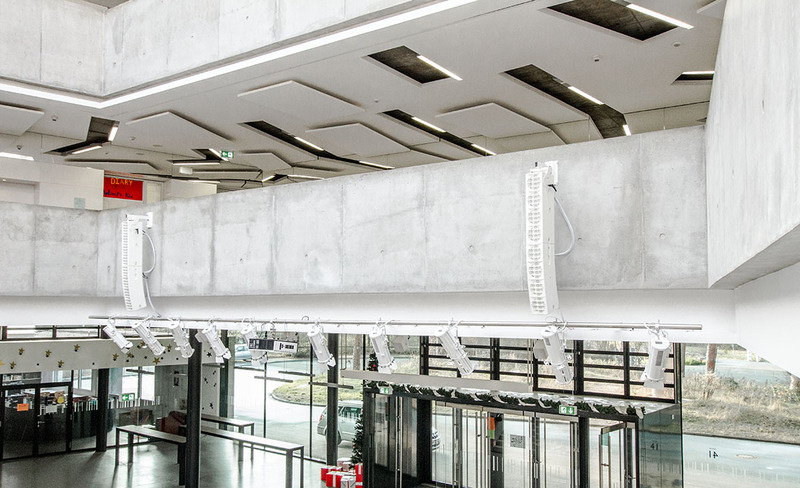 To ensure the lighting system was as flexible and as long-lived as possible, RGBW LED spotlights were used throughout. 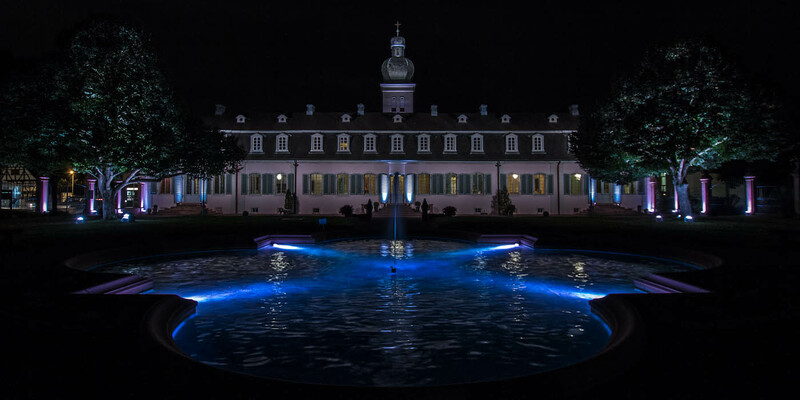 The north façade of the manor house facing the park was illuminated using architectural floodlights, placed on two specially designed lampposts. 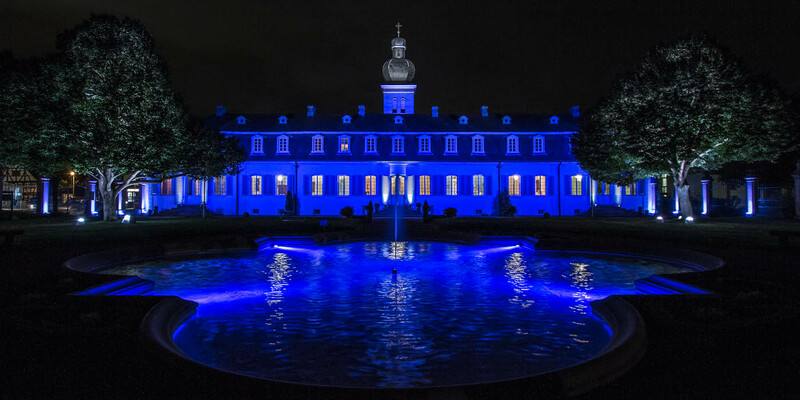 The fountain and the standout trees in front of the building were integrated into the lighting of the property. 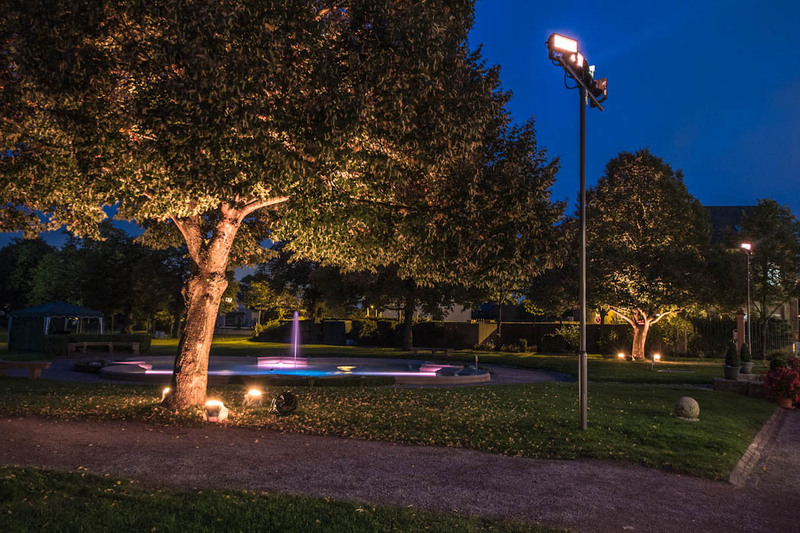 An additional element is the W-DMX equipment for the grounds, to manage mobile battery-powered LED lights for events held in the park. The concept also included lighting of the walkways and two pavilions in the northern part of the park, which were included in a second stage of the project. To operate the lighting, we decided on a GrandMA onPC system with MA network nodes, largely due to the agenda function. The design included products by SGM, Philips and Expolite. 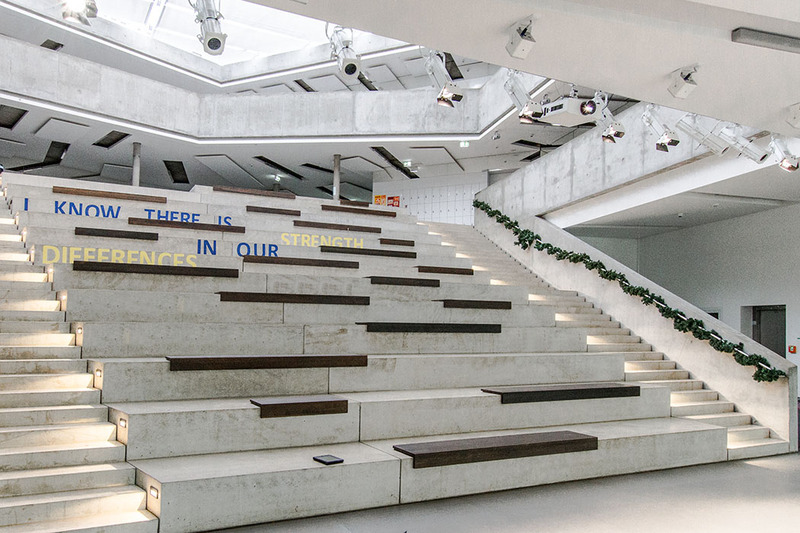 In the new building at the International School on the Bergstraße, the largest school in the Darmstadt-Dieburg administrative region, there is an auditorium used for assemblies. The events held here include school assemblies, theater and musical performances, presentations and talks. The school’s auditorium is shaped like an amphitheater with surrounding galleries. The surfaces in the auditorium consist of three materials: concrete, glass and a plastic film in the area of the domed roof. 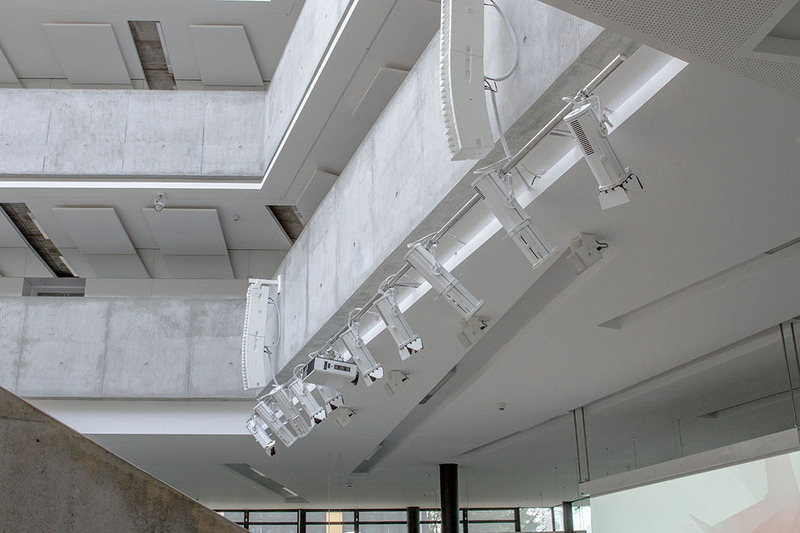 In view of the auditorium’s multipurpose nature, we worked closely with the architectural firm (Angela Fritsch Architekten) and the Darmstadt-Dieburg administrative leadership to plan the sound, light and video system for the space. This project posed challenges especially regarding the acoustics and the integration of the events technology system into the architecture. The devices in the visible area, such as loudspeakers and spotlights, were selected in close collaboration with the architectural firm. Our planning was subject to the three elements of sustainability: ecology, economy and social requirements. One example is the fact that the LED lights use 60% less electricity than conventional halogen lighting would have done. Using the best equipment from current brands also has the advantage of being long-lived and resistant to breakage, and is even a learning opportunity for teachers and students alike. 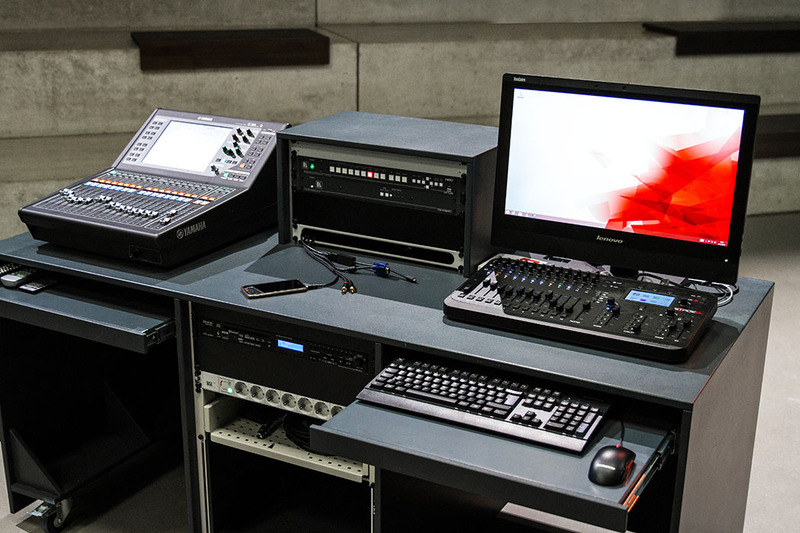 The equipment was chosen with the idea that it can be used in a pedagogically useful way. 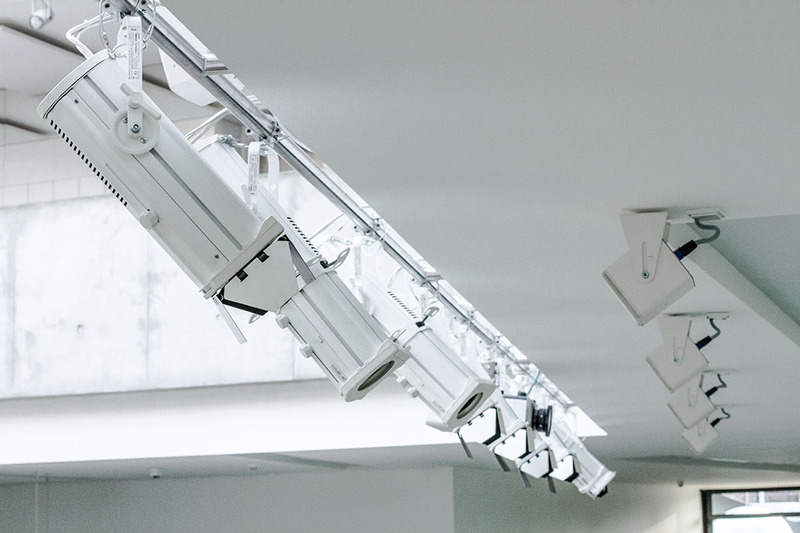 One special aspect of this case is the individualized design of the lighting mount, made of stainless steel, which at first glance appears to be floating in the auditorium space. We also designed a director’s table for all the technical devices, which allows a person to work in an ergonomically correct way while sitting. Find out more about this project on the website of the technical journal „Professional System“. 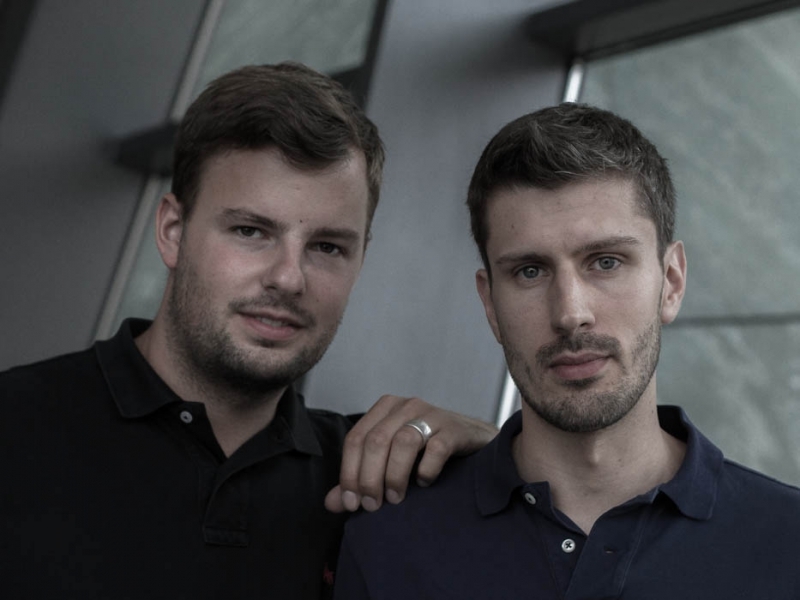 Wilhelm & Maaß is a planning and consultation firm for technical concepts in media and events management. This includes permanently installed features and temporary setups, from planning to calling for bids, project management and after-sales services. 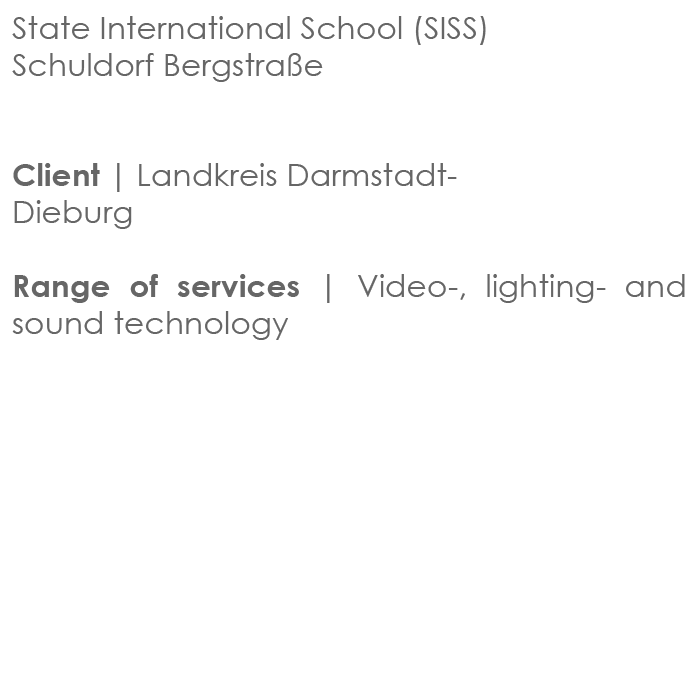 Our office is a place where ten years’ professional experience, engineering and business expertise converge. Flexibility, a fine aesthetic sense and sustainability in economic, ecological and social terms are our aims and our passion.